In Japanese author Ueda Akinari’s short story "The House Amid the Thickets," a man returns home to a cottage like the one in What Remains of Edith Finch. Unlike the Finch residence, the house he initially perceives is still alive. His doting wife is still there, alive and loving, having waited for him to return home all these years. The house's unique structure, built by his own hand, still remains. A cozy bed awaits him. Then he rests, and everything changes. The blanket he thought was there is now just leaves; the wetness of the room the result of a light rain dripping into his roofless abode. The man's home was hardly a home anymore. It had been taken over by nature, and his now-deceased wife's grave lay nearby. (The woman from earlier was just a ghost, waiting for her husband to return home.) "It is only I, and I alone who remain unchanged," he weeps, upon this realization that the life he used to know is now in shambles. Time has passed, and claimed everything from him. And now, all he has is a memory to live by, thanks to his dilapidated house. 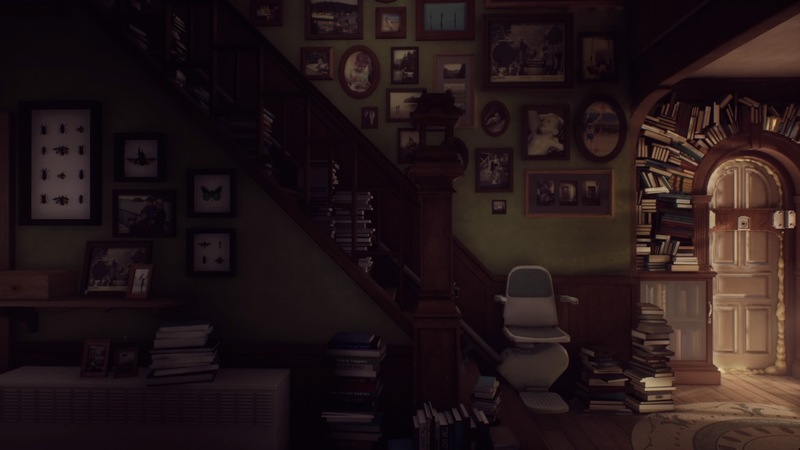 In What Remains of Edith Finch, the player inhabits Edith, the last living remnant of the Finch family. Edith is returning to her childhood home, an impossibly towering house buried within a forested island. The Finch family has suffered a curse over generations—or just extremely bad luck, it's left ambiguous—where every living member is doomed to die prematurely, through some ordinary (or less-than-ordinary) way or another. The house towers high, every new generation having built upon it, never longing to reoccupy the rooms of the deceased. Each room has instead been boarded up, their old belongings resting within like a tomb. A memorial of the person that was once here and alive. The Finch house feels haunted in a way, where the ghosts of the Finch family Edith never knew haunt its domestic spaces. From the outside, the house is comparable to real-life oddities: the Winchester Mystery House, Broken Angel House—houses built to impossible lengths and heights. Walking within it, it errs more on fictional homes, from the haunted reminder of what a man left behind in Ueda's "The House Amid the Thickets," to the mansion in Shirley Jackson’s ambiguous "The Haunting of Hill House." Edith is our anchor to everything in the impossible Finch house. She’s inherited the Finch home after her mother has passed away. So, as any newly orphaned teenager at a crossroads would do, she returns home after six years away. She navigates the labyrinthine home, a house gated by keys, locks hidden inside books and crawlspaces. The Finch residence is one built with its quirks in mind. It's a decrepit house that breathes as a living reminder of the eccentric Finch family's many generations, beyond the literal cemetery in the backyard. What Remains of Edith Finch will be dubbed by the most sneering of players as a "walking simulator," a "genre" bid that’s thrust upon games with minimal interaction. The player walks around an environment. Sometimes, they're enabled to pick things up. In What Remains of Edith Finch, Edith walks forward. She flicks on light switches. Her gaze leads her to new internal narrations (which float across the screen in literal words, as if each footstep is a scribble in her journal). But then we occupy someone else, somewhere else, in another time. Games have always promised us that we can walk in someone else's shoes for a change, seeing a new world from a fresh perspective. But few make good on that specific promise. What Remains of Edith Finch does. With each room, Edith stumbles upon a memorabilia of some sort—a journal, a viewmaster, photographs, etcetera—and it transports the player into a new mind during their final moments alive. In one, I'm Molly, the most unreliable of narrators, as her innocent hunger leads her on a wild goose chase for sustenance. In another, I'm playing playing through a comic book-bound retelling of former child star Barbara's final night alive. One time, I just flip through an imaginative flip book. Every story through the Finch family tree has a different interactive gimmick to absorb the player. Like a sequence seen entirely through the lens of a camera, or the gleeful imagination of a baby in a tub, as the baby's father wonders over narration what the world the infant sees is like. Every sequence is deeply harrowing in its own way. We know how they end upon entering them: with death. But at least, we get to see them alive, maybe joyous, maybe not. But there, present. Almost blissfully unaware (or aware) that death awaits them. That's where the power of What Remains of Edith Finch lies. In other narrative games of its ilk, the player is often anchored to a single character exploring a story. In What Remains of Edith Finch, we're granted access to over a dozen family members, as they share their unique encounters with death, life, love, and more. As the interactions shift per sequence, I felt as if I was genuinely inhabiting a new mindset. I was a father documenting a hunting trip with my daughter on film. Later, I was a grumpy kid flying a kite. With stumbling narrations always guiding me—sometimes literal, sometimes poetic, sometimes unreliable—the game carried me through vignettes of the lives of many effortlessly. Even if some of the vignettes carried far more weight than others. 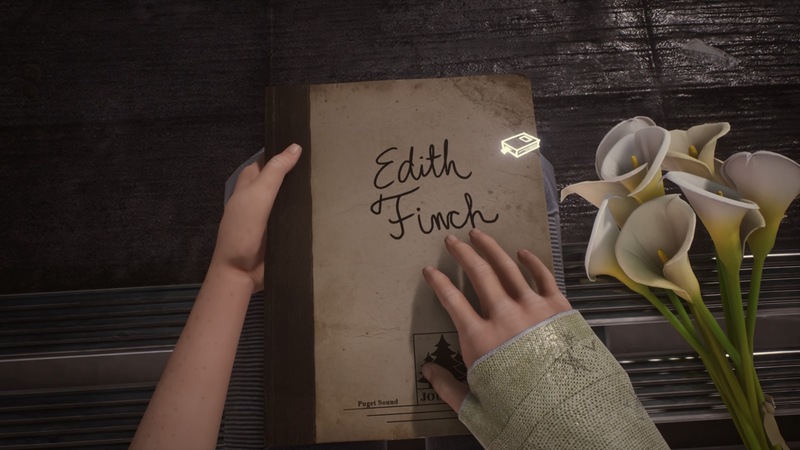 What Remains of Edith Finch quite literally wears its literary references on its sleeves. Upon entering, Edith remarks that the house doesn't look cluttered in a gross sense, but more like a "smile with too many teeth." Books line the walls, as if there weren't enough bookshelves in the world to be able to house them. Their titles jump off to the eagle-eyed player—Peter Pan, Oliver Twist, a probably-hyper-condensed copy of Infinite Jest. The Finch residence is a house of pure excess: in lives lived, in structure, in the sheer amount of stuff. Edith's uncovering the family history she never knew, just as we the player are. She remarks on the memories of her brother, or how she now understands now why her mom named their cat Molly. She offhandedly describes growing up in the house with both her mother, her two brothers (one disappeared while she was young, the other committed suicide), and her grandmother Edie. The dynamic reminded me of growing up with my mom (a young single mother who had me at 21) and my nana. My nana was the "cool" grandma, the one who let me watch whatever I wanted on television, and told me stories about her childhood growing up in (*gasp*) Canada. My mom was stricter, likely stressed from juggling work and school and raising a child in the thick of it all. They bickered quite a bit as I grew up, just as Edith notes Edie and her mom did. But I know deep down they both had their reasons, their ideas of what raising me should be like; what I should know, and what I shouldn’t know. What Remains of Edith Finch is a familiar ode not only to death, but to life. Even if the story sometimes gestures a bit too much towards clichés, it manages to feel like a literary anthology in ways few games are. It relishes in knowing that we're all connected to others through stories, supernatural or not, and that we should embrace our loved ones, and seek to understand them as best we can. Because hey, life is short. The music is quietly haunting and subtle, with the occasional sweeping orchestral melody during pivotal moments. Despite very minor frame rate issues, the game is often very striking in its heavily detailed domestic spaces. Some sequences change the style too, including a cel-shaded sequence. By the end of What Remains of Edith Finch, I felt close to the Finch family. I felt close in a way that only games could articulate with their unique interactive language. I was a kid on a swing, trying to get as high as he can. I was a baby in a bathtub. I was a curious, hungry kid. 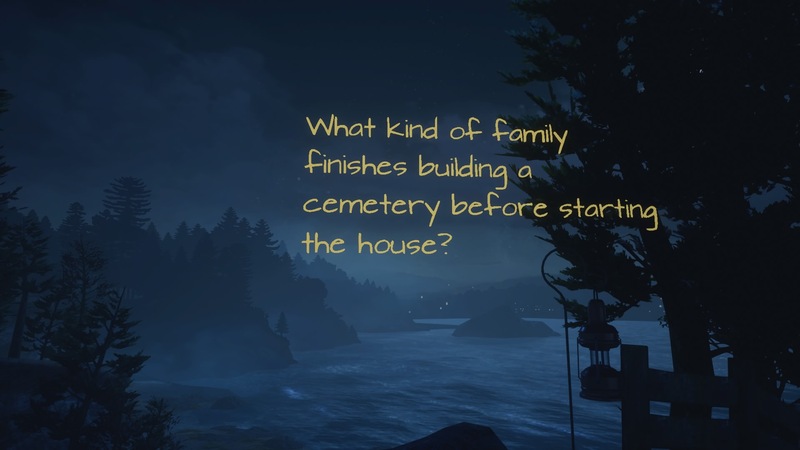 What Remains of Edith Finch doesn't just tell you about the tragic history of the Finch family, it allows you to embody it. Tagged with Reviews,	What Remains of Edith Finch. From Getting Over It With Bennett Foddy to Dream Daddy, here's what indie game creators who made a splash in 2017 look forward to in 2018.